Jupiter Ascending is a odd film. I find myself torn between my desire to speak about what I consider to be some interesting facets of the film and the fact that this film which in many ways requires no thought at all on the part of the viewer. of what I'll kindly choose to call; it's plot. Yet there is a far more important aspect to this film that is rooted in the sheer audacity of vision that the film makers have tried to assemble onto our screens. This is an age when audiences are champing at the bit for original content amid the vast ever flowing downpour of reboots, remakes, re-imaginings, sequels and the seemingly endless deluge of repurposed media in the form of books, TV shows, comics, games and the like. 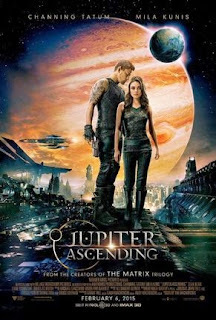 So Jupiter Ascending stands as a ambitious attempt to bring a truly original fantasy adventure to the silver screen. A film created from scratch, specifically for the movies. We should have all loved it. After all, this is what we asked for, wasn't it? The problem is that original stories are pretty darn hard to think up. So while this is not something that has existed before, the writers were unable to make it stand alone without it being a hodgepodge of half remembered scifi concepts form a myriad of old books and movies that most media junkies can instantly recognise and many non-geeks know through a kind of storytelling osmoses. So in a time when this film should be lauded for giving us what we claim to want, original storytelling, the film comes off as a unoriginal mess that is less coherent than the most tentatively "based on" type film of an already established IP. One thing though. The film looks fantastic. As computer graphics have improved over the years we have been approaching a time where they fail to impress us. When I was a small child, I went to see Star Wars and my brain exploded in awe as the Star Destroyer slowly moved across the screen. This was an effect that simply had never been dreamed of and the very real physical experience of simply not believing what I was seeing was a gift from those film makers to the world. It was a spectacle, like seeing the Aurora Borealis or an eclipse. An event like no other. The visual experience itself had entertainment value. Audiences have spent decades absorbing the growth of special effects, and I am using the term "special effects" as a catch all for make up, sound and the like when creating a visual sequence. That growth has lead us to the point where literally anything a writer can communicate in sufficient detail can appear on the screen. The opening of Star Wars and the audience reaction to it can never be recaptured as the power of it and other early films effects were not in what the effect was showing us in relation to the narrative, but in the effect itself. The effect, just as a spectacle was entertaining. Now of course we are no longer hindered by reality in the production of large scale films and the effects have gotten to the point where they are so common and at such a universally high quality that we absorb them as part of the narrative with little excitement. Special effects are an expected reality for film audiences. We have seen building explode, planets crumble to dust, men grow small, robots form out of water, cars drive up the side of buildings; ad nauseam. There is a real fatigue overcoming movie goers in regards to special effects. As the visual event itself is no longer entertaining. We now require meaning to justify the effects existence. Yet there is still one type of film coincidentally of the same genre as Star War, fantasy; that can capture some of that jaw dropping excitement that comes from simply seeing something. Most films and therefore their effects are rooted in the mundane. If you set a film in our world our time, not only is the visual an extension of something we have most likely seen in our real lives, there is a very real chance that we have seen a very similar shot in another film already. It doesn't matter how good your effects are of that car jumping across a river spinning in circles while the hero is hanging onto the roof. We have all seen cars before, we understand crashing and there are a million films with people hanging off things. Fantasy though, is unique as it offers artists a way to depict things that we have no frame of reference for. Things that are beyond our own imaginings. Things that we look upon and feel enjoyment simply though the act of seeing it. Fantasy is the last bastion for pure special effects. Effects that have their existence only justified by their beauty of design and imaginative innovation. This is where Jupiter Ascending excels. The fantasy elements of this film look fantastic and the fantasy concepts are detailed and imaginative. The effects are effortlessly incorporated to produce a truly stunning visual feast were I was entranced by the very scope and detail presented of the universe was a dense textured layer of ideas. The internal logic of the film is tight and they really pushed the visual design towards what I would consider to be some of the best science fiction art I have seen on the silver screen. When was the last time you were just blown away by a space ship at the movies, just by looking at it? Unfortunately, this is just not enough. In a fantasy of this scope the complex plot feels disjointed and even worse unoriginal due to similarities to some of the scifi greats. I have heard a lot of people say the plot dose not make sense but this is not true. The film's plot is in fact coherent if you are paying attention, it is convoluted but it follows its internal logic closely and all the threads tie up. So, this film is a hard lesson for the studio and for film goers. While we claim to want original programming on the scale of famous known IPs, the only attempt in decades to make a truly original blockbuster fantasy has failed in all the important ways. This could be the last time a studio tries this for another 30 years. In the narratives need to present so much information due to the viewer not having any pre-existing knowledge of the universe slows everything down to a series of setups and expositions that wear down on our patience. I feel the real problem this film has is the scale. Yet, I personally did not hate this film. I found it far more entertaining than many of the large blockbusters it was in competition with. When you have films like Transformers or Fast and Furious stinking up the screen how can this film attract such scorn? It is an ambitious, even an audacious film and in my book that is a huge plus in its column. As a voracious consumer of fantasy and science fiction this film is right in my wheel house and the jumps of imaginative acceptance it asks of the viewer are easy for me to make. I can't call this a good film with a strait face but I've already bought the blu-ray and getting the physical disk on my shelf is a badge of honour I reserve for only the selected few. If only this was a better film. VERDICT: Give it a try, but be warned.